To treat cerebral aneurysms, doctors can use endovascular methods, like flow-diverting stents, that alter blood flow and reduce the risk of rupture. When studying these methods, researchers normally assume that the blood flowing around the stent is a Newtonian fluid. This might be inaccurate, since blood flow around stents is slower than normal. Using the COMSOL Multiphysics® software, researchers tested the accuracy of modeling blood flow as a Newtonian fluid by comparing it to a more realistic non-Newtonian model. Cerebral or intracranial aneurysms occur when arterial vessels fill with blood and expand out in a balloon-like bulge, thinning the vessel wall. If the bulge ruptures, this could cause hemorrhaging. Doctors can treat these bulges (or aneurysm sacs) in multiple ways, such as with surgical treatments or through endovascular methods. Different types of aneurysms in blood vessels. Images by G. Mach, C. Sherif, U. Windberger, R. Plasenzotti, and A. Gruber and taken from their COMSOL Conference 2016 Munich presentation. Today, let’s focus on endovascular methods (for example, using a flow-diverting stent), which slow the blood flow into an aneurysm sac. This starts the clotting process and eventual cicatrization of the diseased area, helping to protect the vessel walls and reduce the risk of a hemorrhage. A typical stent. Image by Lenore Edman — Own work. Licensed under CC BY 2.0, via Flickr Creative Commons. Normally, when researchers study these methods with numerical simulation, they model the blood flow in the intracranial aneurysms and cerebral arteries by assuming that blood is a Newtonian fluid with a constant viscosity. This is based on the assumption that the blood flow has a very high velocity and shear rate, meaning that its shear-thinning behavior can be ignored. This assumption might not be true when applied to flow-diverting stents, which slow the blood flow and decrease the shear rate inside the aneurysm sac, making the blood behave in a less Newtonian way. This brings up an important question: Due to the differences in blood flow around a flow-diverting stent, is modeling it as a Newtonian fluid accurate? 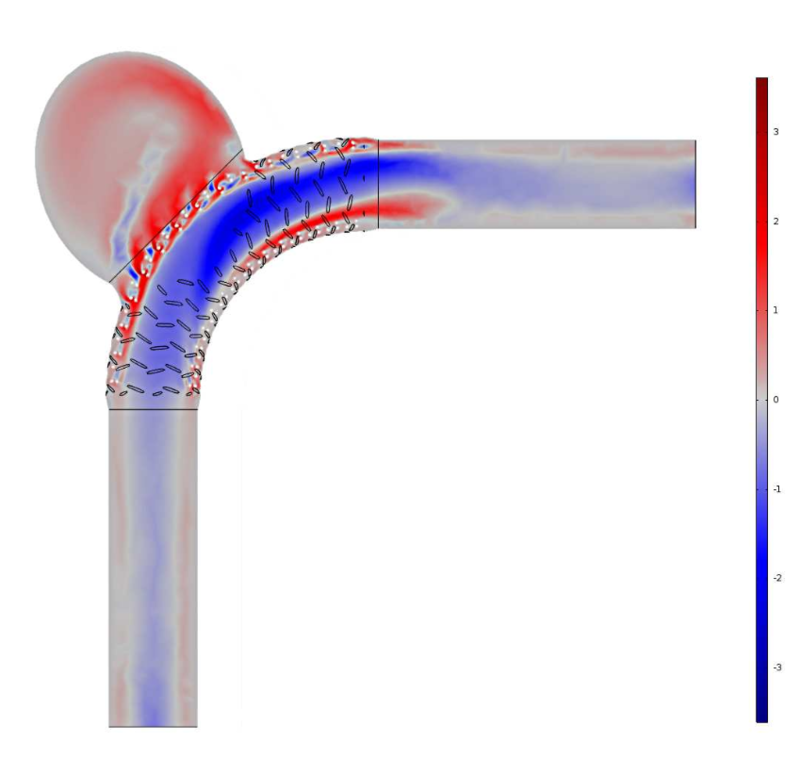 To answer this, the Cerebrovascular Research Group Vienna, with members from the Vienna University of Technology, Hospital Rudolfstiftung, and Medical University of Vienna, analyzed blood flow in an aneurysm sac and blood vessel using the CFD Module with COMSOL Multiphysics. As a first step, the team measured human blood viscosity at different shear rates and used this data to generate model parameters. They also made note that the blood viscosity is dependent on multiple factors, including the shear rate, hematocrit (HCT), and temperature. Next, the team created a model of an intracranial sidewall aneurysm, which is depicted as a round bulge on the side of a cerebral parent blood vessel. This aneurysm is treated by a complex flow-diverting stent, which is located near the aneurysm in the parent vessel and subtracted from the blood-filled vessel domain. Left: The model geometry, including the parent vessel, cerebral aneurysm, and flow-diverting stent. This image shows the aneurysm neck plane and the stent-induced vessel wall expansion. 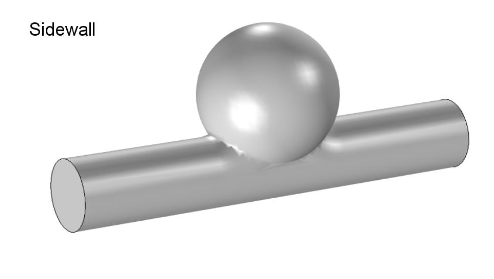 Right: The mesh used for the model. Images by G. Mach et al. and taken from their COMSOL Conference 2016 Munich presentation. 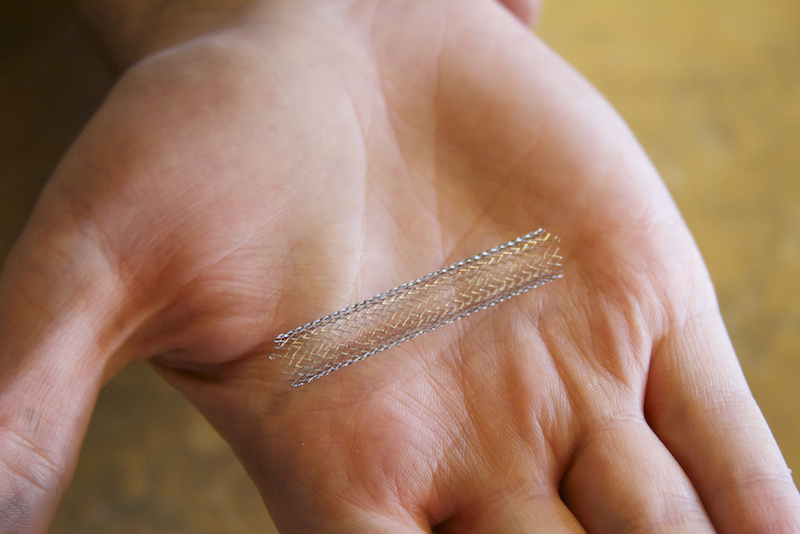 Taking a closer look at the stent, we see that it has a permeability of 55%, similar to industrial samples, and is made of 16 wires that are knitted into a mesh. This is less complicated than real stents, which contain more wires and have smaller cross sections. 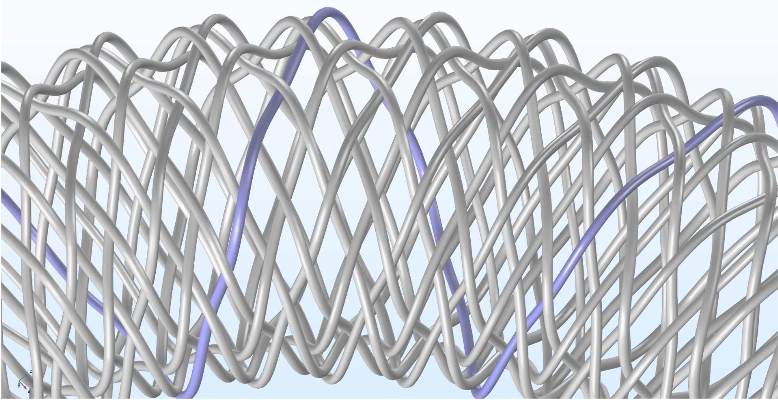 The flow-diverting stent’s waving pattern, with one wire highlighted to show the pattern. Image by G. Mach et al. and taken from their COMSOL Conference 2016 Munich paper. Comparison of the blood viscosity values for measured data with the different models. Image by G. Mach et al. and taken from their COMSOL Conference 2016 Munich paper. When looking at the values for viscosity, we see that, unlike the constant viscosity in the Newtonian model, the dynamic viscosity of the non-Newtonian Carreau-Yasuda model ranges from 3.57 MPa·s to 7.1 MPa·s. Viscosity profiles for the Newtonian model (left) and Carreau-Yasuda model (right). Images by G. Mach et al. and taken from their COMSOL Conference 2016 Munich presentation. 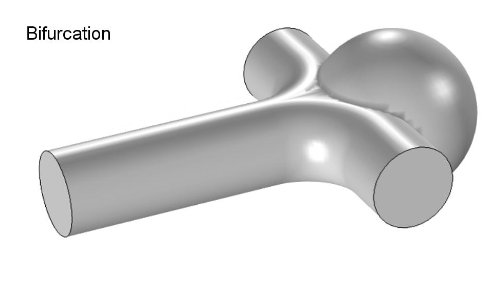 Between the two models, the Carreau-Yasuda model has a slightly larger range of shear rates as well as higher values for the total flow rate into the aneurysm sac and average velocity within it. As a note, all of these comparisons are made when the systole, the highest velocity profile value, appears at the inlet plane. Blood flow velocity profiles for the Newtonian model (left) and Carreau-Yasuda model (right). Images by G. Mach et al. and taken from their COMSOL Conference 2016 Munich paper. These numerical results indicate that the Newtonian model overestimates the flow-diverting stent’s effect by around 4–6%. Although the flow profiles don’t show these differences, they are indicated by the characteristic numbers. 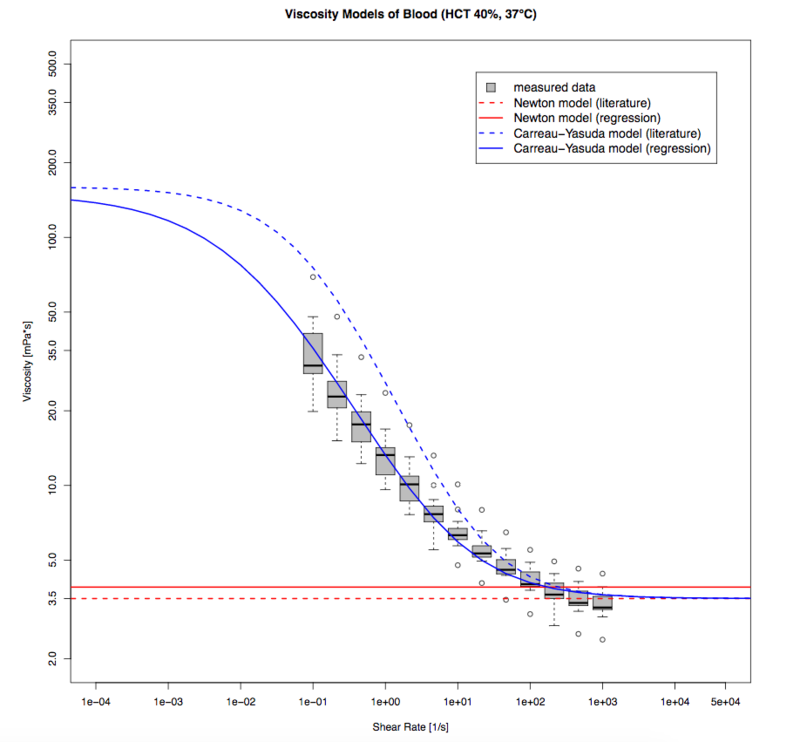 Therefore, it appears that the Newtonian model is not accurate enough to analyze blood flow past endovascular devices. The difference in velocity profiles when the Newtonian model is removed from the Carreau-Yasuda model. Image by G. Mach et al. and taken from their COMSOL Conference 2016 Munich paper. The research discussed today provides a solid foundation for testing the accuracy of Newtonian and non-Newtonian blood flow models. 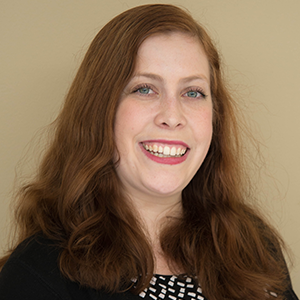 The team plans to continue improving the accuracy of their models by making more blood measurements at lower shear rates and gathering 3D images of actual flow-diverting stents in vivo. By using the new data and tomographic images, they hope to enhance their model’s accuracy. development of varicose veins with COMSOL? We believe that this is possible. For example, varicose veins have malfunctioning leaflet valves. These valves are no longer able to close properly due to the deformation of the veins. We believe that this can be studied with COMSOL Multiphysics. 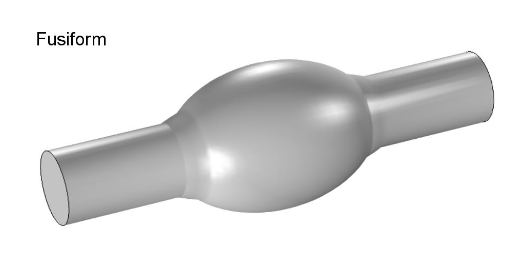 You can read a related blog post here: https://www.comsol.com/blogs/modeling-fluid-structure-interaction-in-a-heart-valve/ . This post discusses fluid-structure interaction (FSI) in heart valves. We think that similar FSI models can be used to study the impact of vein deformation on the ability of the valves to meet properly.